Though Apple’s iPhone and other Smartphones have arguably made the “Point and Click” camera obsolete, it’s hard to imagine they could ever replace a high-end Digital SLR camera – but with the right components they’ll sure as hell try. Case and point, Otterbox has just announced their uniVERSE Case System which combines an iPhone 6/6s or 6 Plus/6s Plus case with add-on accessories like an external battery, expanded storage, a camera lens system, and a tripod adapter – just to name a few. I hope my fellow freelance writers are paying attention – because this case has the potential to be a real piece of fried gold! At the core of the uniVERSE Case System is the case itself; an affordable, slim line, hard polycarbonate body with a structured rubber interior that meets Otterbox’s Certified Drop protection requirements. From there the whole thing turns into one of those “Choose Your Own Adventure” scenarios: you can either leave at that – just a phone case – or you can build on to it with select accessories which Otterbox is marketing as “modules”. 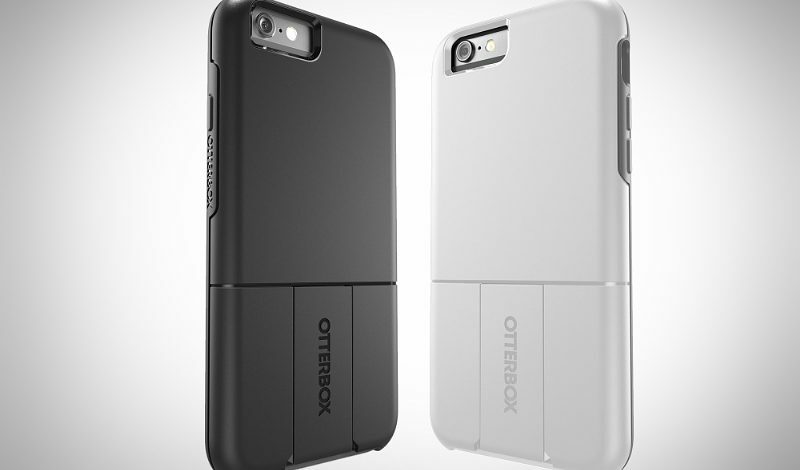 Both PolarPro and GoalZero have teamed up with Otterbox to offer the user an external battery pack designed to double the battery life of the iPhone 6/6s or give you an extra 75% of power for the iPhone 6 Plus / 6s Plus. Pairing with SanDisk, Otterbox has integrated the use of the iXapand Flash Drive system to allow you to increase your data capacity by 64GB or 128GB. The uniVERSE case works with the olloclip 4-in-1 lens system which allows you to switch between fisheye, wide-angle, 10x zoom, and 15x zoom lenses. This won’t improve your picture taking in a low-light setting but it certainly capitalizes on the iPhone 12mp camera with 2.2 aperture. Rounding out the expanded and improved photography capabilities is the ability to add-on a tripod, which of course will probably lead to the ability to use a selfie-stick as well. All of this is just the tip of the iceberg of what Otterbox’s uniVERSE Case System is intended to do. Their press release features other modules aimed to improve your connectivity, productivity, and overall business savvy. Additionally, there’s still more on the docket being offered to make this iPhone case the most desirable multi-function case ever to hit the streets. Sweetening the deal, all of the accessories are relativity affordable when compared to others which usually require a specialty case of their own. The only drawback I can see with the Otterbox uniVERSE Case System is that it is not a fully-featured “rugged” case like their Defender, which could conceivably limit some of its uses in the outdoor world. As a guy who “needs” a rugged case, I’m not sure this is a deal breaker for me – as the ability to improve the camera lens, battery life, and even extend the data capacity is very appealing to me. Also, knowing that it can all be packed into one phone case is really alluring. I guess I’ll just have to test one out to see how it holds up in my wicked and wild outdoor world. Looking at the big picture here: the Otterbox uniVERSE is the first modular iPhone case to ever hit the marketplace. If it works as well and as seamlessly as you can assume by reading and watching all of the supporting marketing material – then, WOW. Just WOW. This case has the potential to be the quintessential iPhone case for a multitude of people from all walks of life and professions. At time of publishing, the uniVERSE Case System is available at www.otterbox.com. It will be available through Best Buy and Amazon.com starting on May 29th.